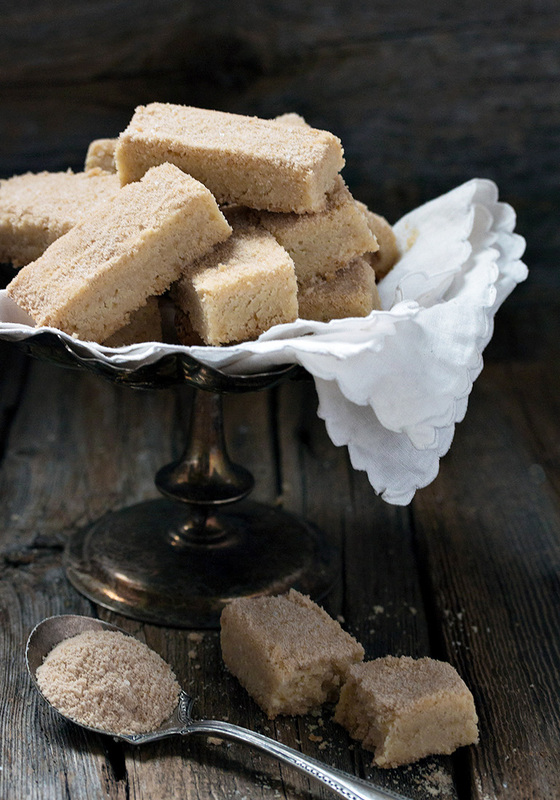 This Maple Sugar Shortbread Cookies literally melts in your mouth! It’s both flavoured and topped with fine, pure maple sugar, for a lovely snacking cookie. My celebration of all things maple continues today with these delicious Maple Sugar Shortbread Cookies. 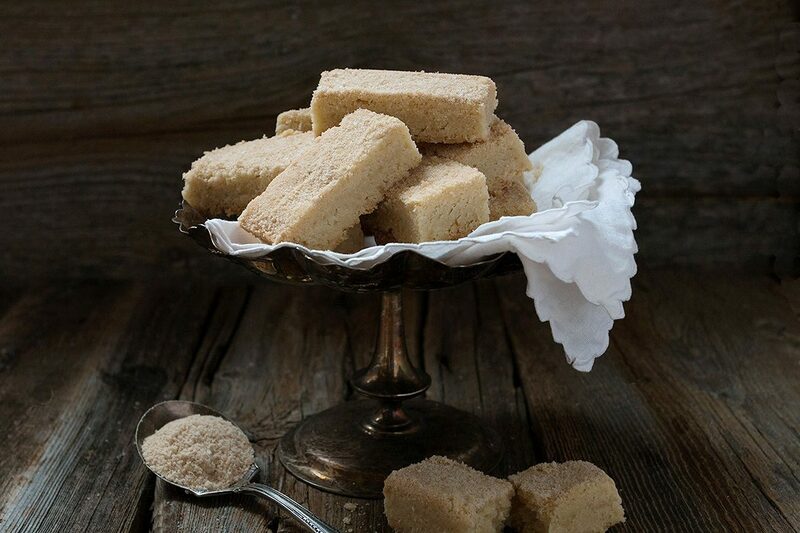 The texture of these shortbread is absolutely wonderful. Melt in your mouth! They are flavoured with a maple sugar instead of regular sugar. Once baked, they are generously dusted with more maple sugar. The result is a most delicious cookie, that only gets better as it sits and ages. If you’ve made shortbread before, you may notice that this one differs a bit in that it uses melted butter. 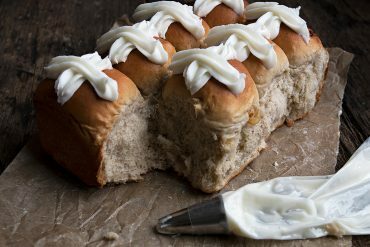 It’s a great technique and no worries about having to plan to pull butter out early until it softens or cutting cold butter in to flour. 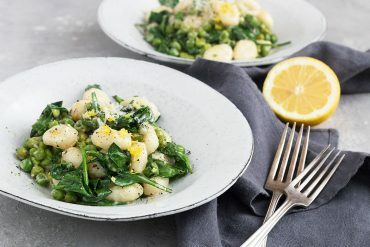 This is an easy recipe that produces wonderful results! 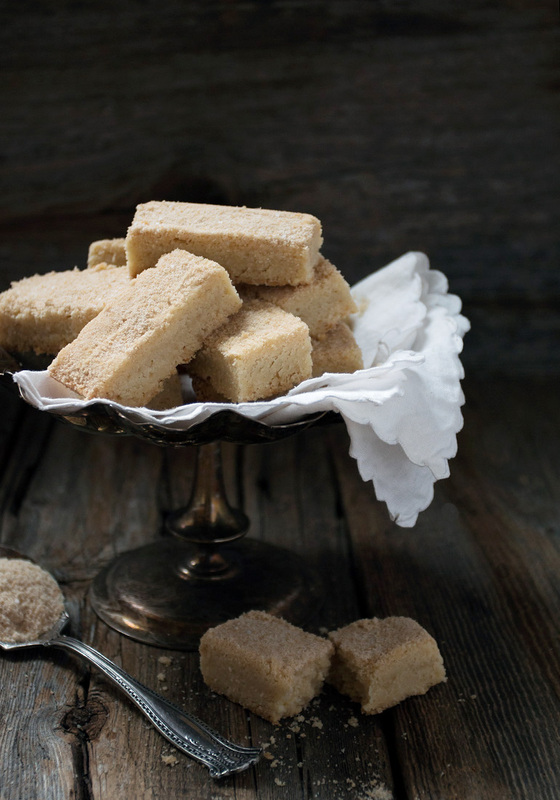 Looking for more maple sugar recipes? 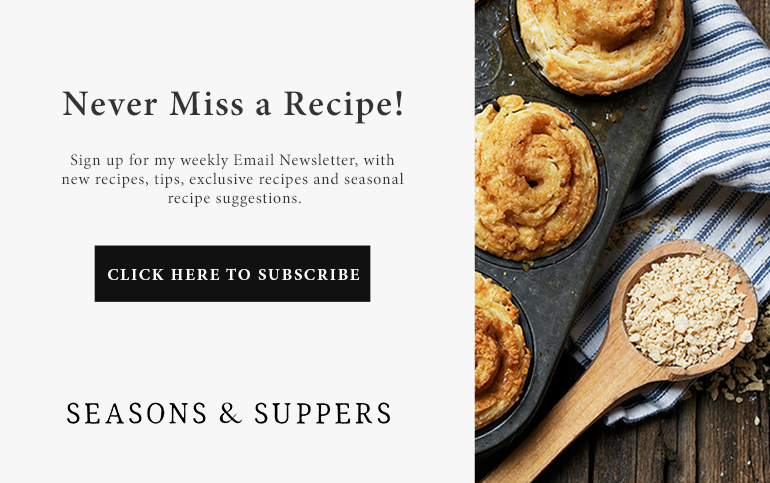 Check out my Maple Sugar Ragamuffins! Just FYI, 250g works out to be just a bit under 2 cups. If you don’t have access to maple sugar, simply replace the maple sugar with regular white granulated sugar in equal quantities. If you can, use a good, unsalted butter. As these shortbread have very few ingredients, the quality of the butter does matter here. Speaking of the butter, you don’t need to let it cool completely to room temperature. It should definitely not be used hot, but it’s ok if there is a very tiny bit of warmth in it. I have included a range of salt to add to the shortbread. I (personally) find 1/2 tsp. not quite salty enough, so I use 3/4 tsp. with the unsalted butter. Your taste may vary. Probably best to start with 1/2 tsp. and see. Also note that if you actually use salted butter with this recipe, you will want to reduce the added salt by 1/4 tsp. Shortbread cookies are ones that actually get better and develop more flavour as they age. 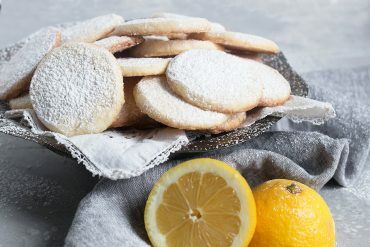 Freshly baked, they are lovely, but as they sit, they really develop a depth of flavour, so don’t hesitate to pop these in a cookie tin and enjoy them over a couple of weeks. 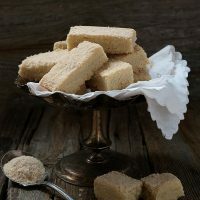 Delicious, easy, melt in your mouth maple sugar shortbread cookies that are both flavoured and topped with pure maple sugar. Heat oven to 350F. 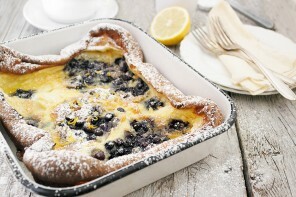 Line an 8-inch square pan with parchment paper, leaving extra at two opposite sides for lifting out. 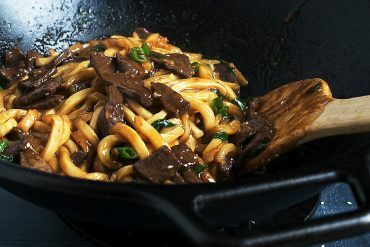 In a bowl, whisk together the all-purpose and rice flours, the maple sugar and salt. Stir in the melted and cooled butter and stir to combine. Mixture will be moist, sand-like. Press dough evenly in to the bottom of the prepared pan. Bake until golden brown and set, 30-35 minutes. Remove to a cooling rack but while still warm, sprinkle evenly with additional maple sugar and slice, then allow to cool completely before removing from pan. I’m a huge shortbread fan Jennifer. I can’t wait to try these! Love the maple sugar! Thanks Mary Ann :) I think you would love these! 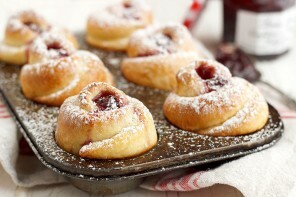 These look completely perfect Jennifer! 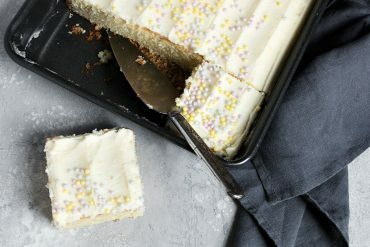 Who could resist such a buttery melt-in-your-mouth treat? How lucky you are to live in maple syrup land. I need to find this maple sugar soon! 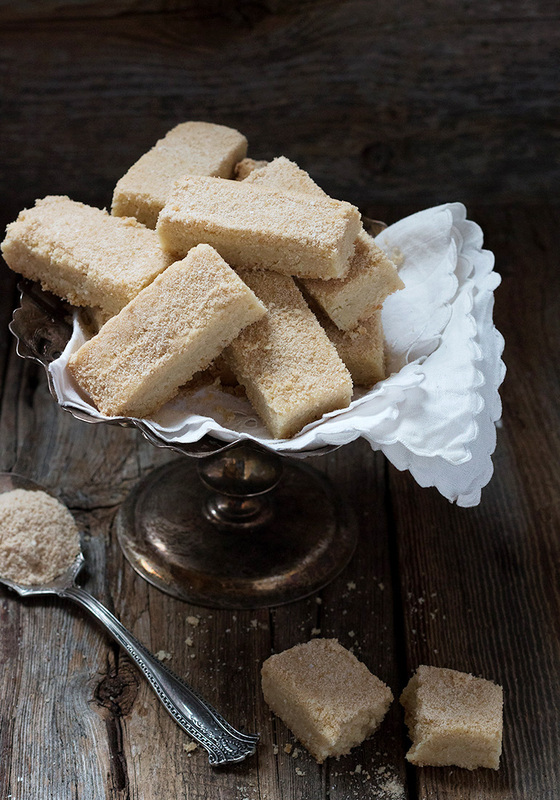 I love shortbread and these sound absolutely divine with the maple sugar – what a treat! 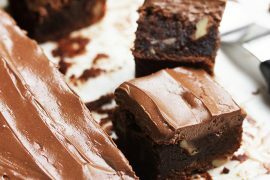 These sound divine! I pinned them for later. I love shortbread! I can just taste these now, the flavor must be so delightful. My daughter is living in Wisconsin and they just tapped their own backyard maple trees ~ I’m sending this along to her!